We slept well under a blanket of stars. We didn’t set an alarm and woke up around 6:15, in time to watch the morning light kiss the granite cliffs around Ruby Lake. We were walking by 7:15. Our packs didn’t feel much lighter than yesterday but our bodies were rested. 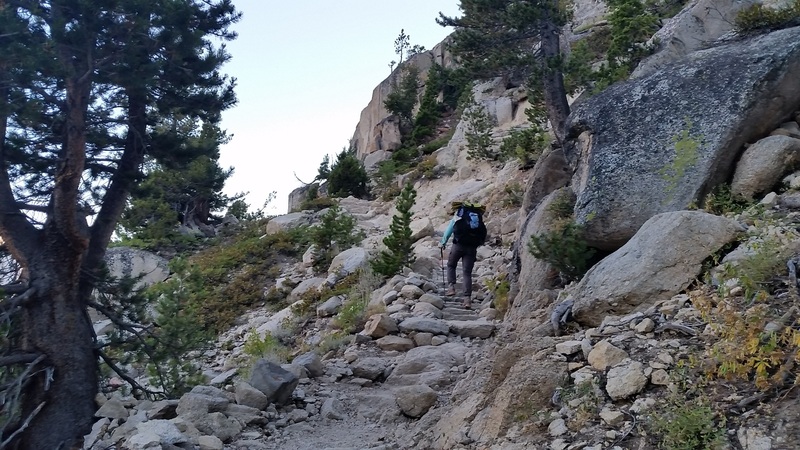 As we started to climb up toward Mono Pass Laurie felt her heart racing. Our max elevation during the last 2.5 months was 6ooo or 7000 feet. Suddenly we were at 10,500 feet going up to 12,000. Our bodies were no longer acclimatized. Fortunately we both acclimatize quickly. We anticipate that in a few days we would feel like mountain goats again. But for now, we took it slow, mindfully placing each foot so as not to slip on the sand covered granite steps. Today was beautiful! Narrow whispy looking clouds were scattered across the pale blue sky. We climbed up to Mono Pass via sandy switchbacks. Our lungs screamed everytime we took a drink as the moment was dedicated to drinking rather than breathing. 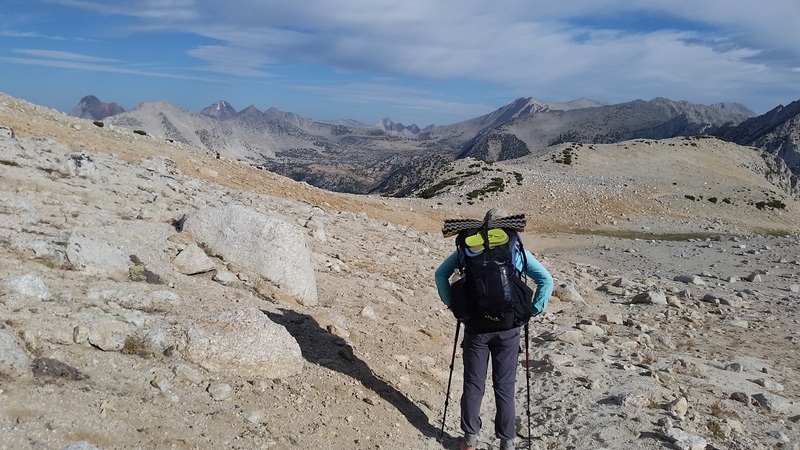 Mono Pass was desolate, the only thing around was Summit Lake. It looked like the Sahara desert or maybe another planet (we have never been to either of these places but assume they look this way). From here we descended, past other lakes, down toward Mono Creek. We took a break about a mile after the pass to enjoy hard boiled eggs and potatoes. Leftovers are delicious but boy are they heavy! We crossed a few steams wondering out loud what they would have looked like in early June. We made a wrong turn and walked an exta 1.2 miles to Fourth Recess Lake. The sign at the junction was confusing and we both questioned our decision when the trail started to climb. Since we were off the PCT our trail maps and apps were useless but we had taken a picture of Big Red’s Topo map. We were trying figure out where we were in relation to creek crossings when a group of 4 guys came around the bend. They confirmed we were on the wrong trail but encouraged us to go to the lake since we were so close. It was beautiful! So beautiful in fact that Laurie decided she had to go for a swim. The water was surprisingly tolerable. 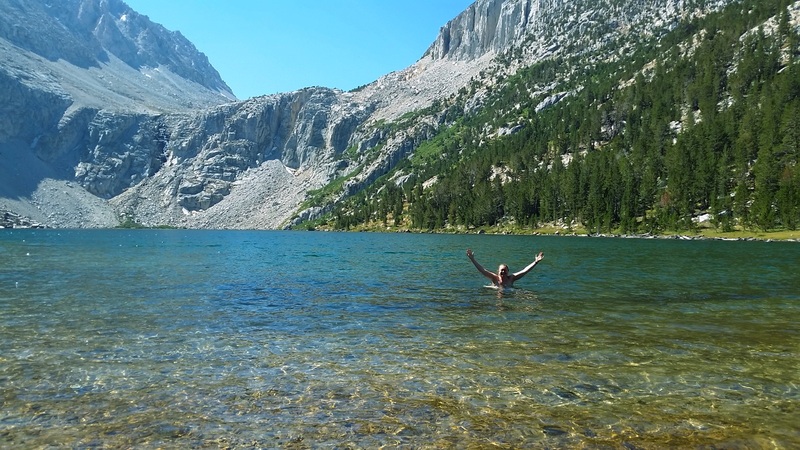 Another great reason to visit the Sierras in September, the lakes are not frozen and actually swim-able. We retraced our steps and continued down on the correct trail. We walked through many piles of horse poop, sand and rocks. We walked past quivering aspen trees and in and out of tree cover and meadows. It was pretty and hot. 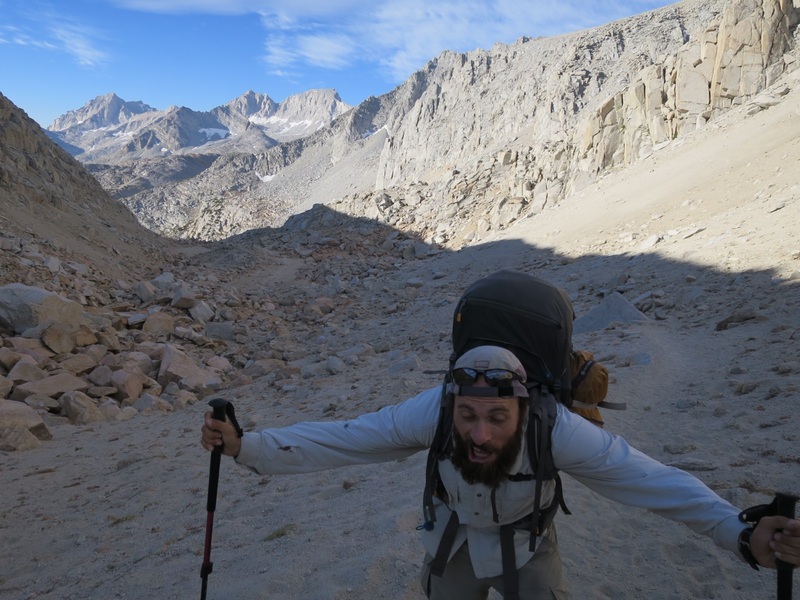 Just before 3 pm we intersected the PCT. We smiled. We had made it back to our familiar 18 inch wide string of dirt we now call home. We hiked south for 1.3 miles to the junction where 2.5 months earlier we had veered left toward Lake Edison and the ferry to VVR. We touched the sign and spun around. From this very point we had 406.3 miles to go to complete our thru hike! We started our climb up toward Silver Pass. 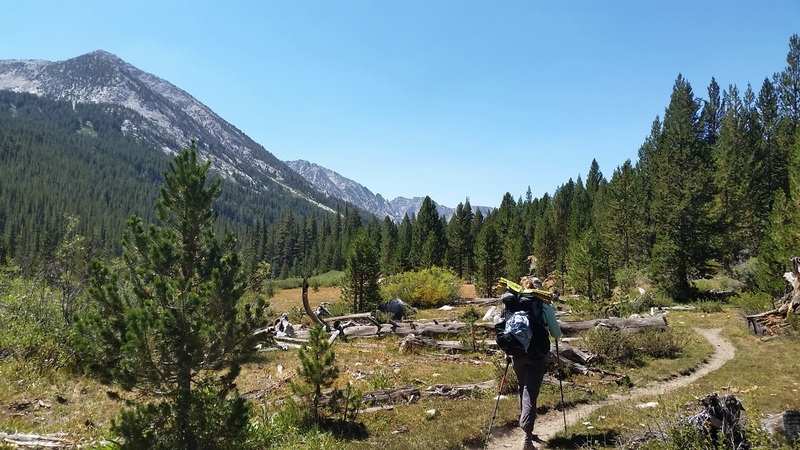 Originally we had hoped to make it another 11 miles to Virginia Lakes but given that it was already 4:30, we made a new plan. We easily crossed each stream, trying to figure out which ones were the “waterfalls” that people described in early June. Some of the creeks were now stagnant pools in a river bed. It is amazing how much can change in a few months. We stopped to talk with a guy named Al. We met him originally on our way down to the VVR junction when he asked about camping and water options up the trail. We consulted Guthook and Halfmile and gave him info. We picked up our speed as we climbed up the granite steps toward the pass. We got to Silver Lake at 7:35. 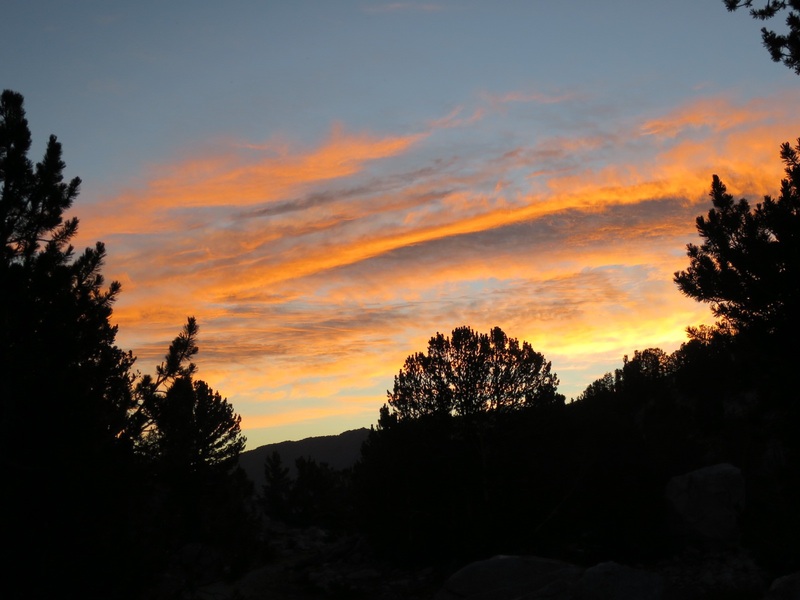 The evening glow was just fading from the hills to the east. We went to the lake to get water and wash the dirty sand from our feet and legs. Despite wearing long pants, gaiters and socks our feet (and Andy’s legs) get filthy! We searched for a flat spot amongst the few trees at the outlet of the lake. 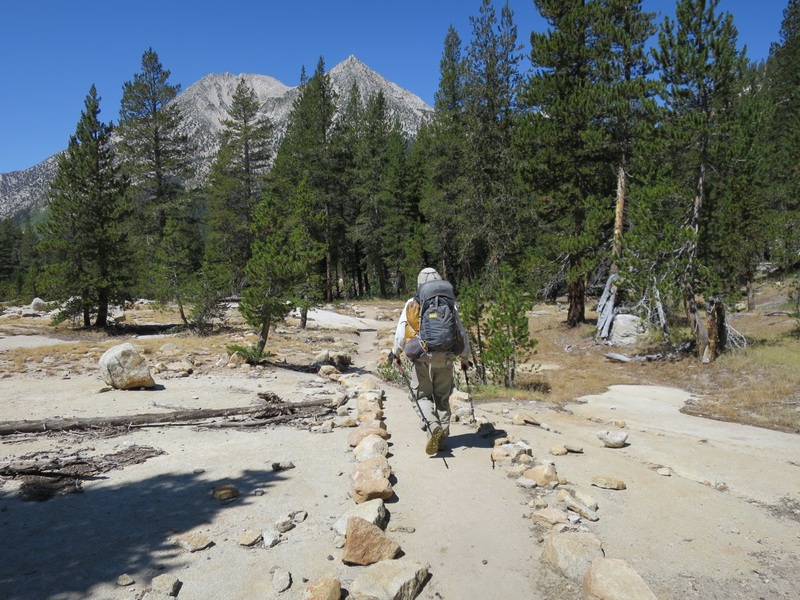 We had asked a southbound JMT hiker if they had seen people camping at this lake and they said no. Surprisingly everywhere we looked we saw tents. We saw a nice flat spot protected from the wind but someone had chosen to store their bear can there. Laurie was tempted to move it but Andy didn’t want to touch other people’s things. So we settled for a spot with a small root in the midle and set up the tent just as the final light left the sky. Andy cooked as Laurie inflated the pads by the light of our headlamps. We can tell the days are getting shorter. In the last week, even in northern Washington, we had relied on the light of our headlamps more than the rest of our entire hike. We enjoyed a delicious dinner of dehydrated leftover pasta and then lay in our sleeping bags staring up at the Milky Way. Tonight we are grateful for easy creek crossings and opportunities to gaze at the Milky Way. 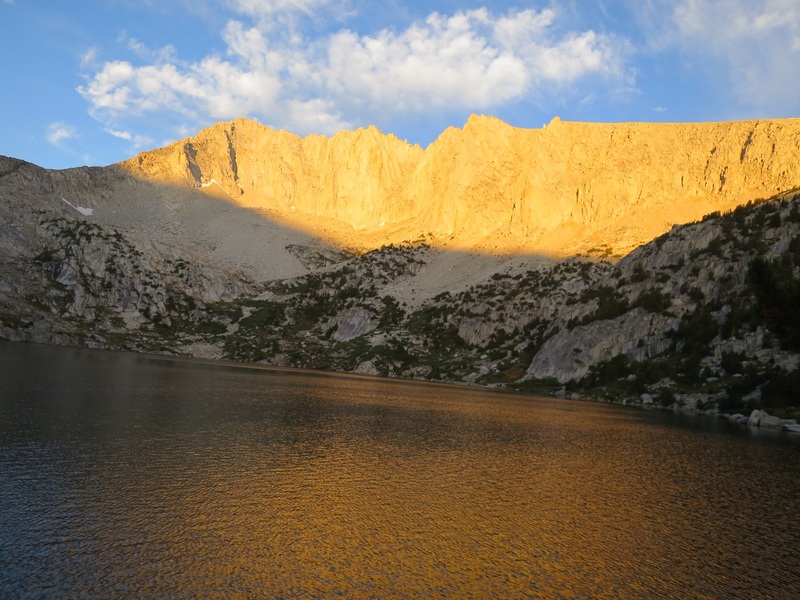 We’ve used Fourth Recess Lake as a base camp on several occasions. 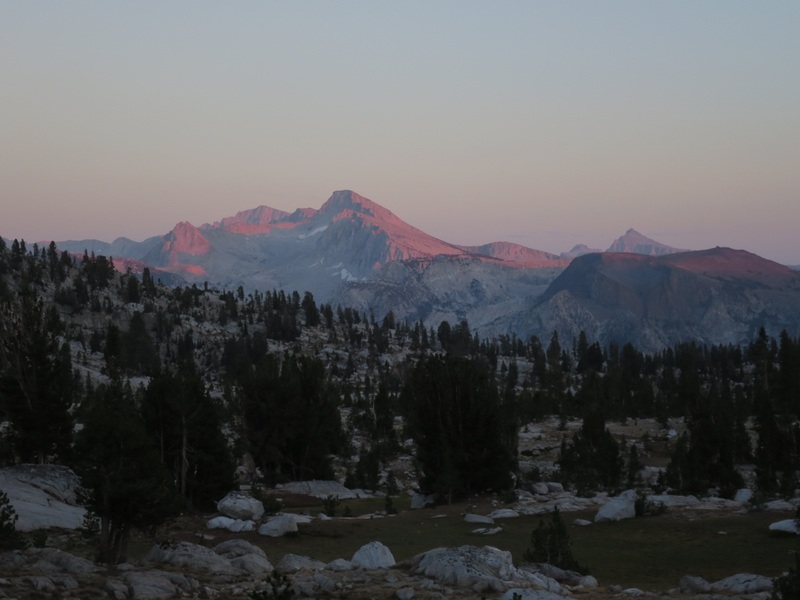 There are many great hikes in that area and some of the best fishing I’ve experienced in the Sierras! Going to miss your posts as you are now in the home stretch. Excellent imagery as always. Thanks Scott. And we love the Fourth Recess area just as much. Definitely worth exploring further.